It might not have as many taps as your beer fest. It might not have as many vendors as your beer fest. It might not have as many people as your beer fest. Yet, it is certainly one of the best beer fests hands down. The 2015 North American Organic Beer Festival, NAOBF, was awesome in many ways and still is. They'll be open at noon through Sunday the 16th. Some of the ways mentioned above and in others as in the quality of the beer and the minuscule amount of waste produced. Last year's fest only produced a touch over 100 lbs of garbage with thousands of people coming. That's an amazing accomplishment. The beers, they were top quality as well. Most recommended beer: McMenamins Edgefield Brewery - Double Barrel-Aged Pavol the Collect Baltic Porter. This was the most mentioned beer when I asked for recommendations or stand outs. It was powerful and sweet, and may have been a bit much for such a sunny day, but this one would absolutely kill at the Holiday Ale Festival. I want this one to return just so I can see the lines. My favorite: Fort George Brewery + Public House - Spruce Budd Ale. This was another recommendation and I'm glad I followed up on it. There have been other spruce tip beers in the past, I'm looking at you Rogue, that have been a bit too much like sucking on a tree branch for me. This one was fantabulous and hands down the best I tried. You have to try this: Pinkus Müller - Münster Alt and Organis Ur-Pils. Your not going to be able to find these on draft without some significant travel. These are tapped at 4 PM and was the only time I saw a line more than a few people long. Beau's All Natural Brewing - Lug Tread - Great crisp light and refreshing lagered ale. Ordnance Brewing - 9131 Brown - A bit thin for a honeyed brown. Riverbend Brewing - What Does the Fox Say - Recommended to me, but didn't quite work for me. Biggest Surprise: Widmer Brothers Brewing - E. Nygma. Widmer brewers often go nuts for fests and come up with something pretty out there. I really appreciate their desire to experiment, but don't always love the output. This year they brought a single hop IPA that I would definitely buy a 6 pack of. Bonus: Dump Truck - you have to eat there. I loved the pork dumplings, but am still kicking myself for not trying the bacon cheese burger dumplings. 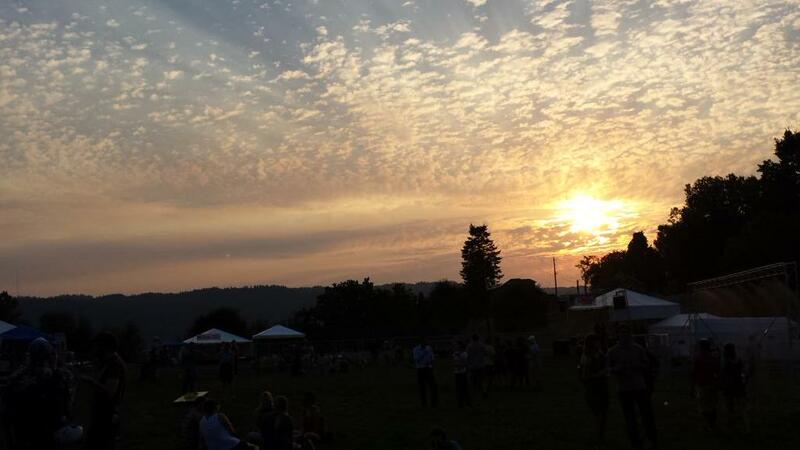 World's largest organic beer festival, Aug 13-16, 2015 at Overlook Park. 50+ organic beers & ciders, live music, food, vendors & more! What's not to like about beer festivals? There's beer, generally quite a lot of it, and it can be very good, it also can be pretty awful. You know what else they have a lot of at beer festivals? Yes, drunk people, but also trash. Festivals generate an incredible amount of garbage. Part of that is the structure of the festival, part of that is people don't always make the best choices when they imbibe. Heck, people don't alway make the best choices of what they imbibe, how else can you explain Four Loko. The North American Organic Beer Festival, NAOBF, or just the Organic Beer fest is different. Check out these stats from their site. In the interest of sustainability, NAOBF works diligently to minimize its waste stream. In fact, of the 2,018 lbs. of waste generated at the 2014 event, NAOBF kept 95% from going into the landfill due to extensive composting and recycling efforts, and the event generated only 101 lbs. of garbage. This was the third year in a row that NAOBF diverted over 90% of its waste from the landfill. Only 101 pounds of garbage from the whole festival? That's awesome. Granted this isn't the size of OBF, but it's not a tiny festival either. There will be over 50 beers and ciders on tap. This fest appeals to me on so many levels. The commitment to waste reduction, encouragement of transit and bikes, family friendly atmosphere, and it's in my neighborhood. I haven't always made it due to travel schedules, but I will this year. I'll be pouring Thursday afternoon for the opening day and sampling after that. Some of these are from favorite breweries, others the description as peaked my interest and others, like Pinkus Müller, are a unique opportunity. Because all beer drinkers are white guys with beards, right?